You probably know someone who has been embarrassed when little white flakes fell from their hair onto the shoulders of their dark colored shirt or jacket. Or maybe you’ve been through this yourself. 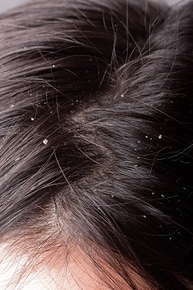 You might be thinking that this is a sign of dandruff. Well, the truth is, that’s not always the case. Flakes of skin from your scalp can also be caused by dry scalp, which is different from dandruff. Many people will try to tell you that you have dandruff, but the only way to really know is to have your condition diagnosed by a doctor. Here are some ways to relieve dry scalp. Go high-quality. Professional shampoos and conditioners are designed to clean your hair gently, which may not always be the case with drugstore brands. Hair products that contain alcohol — such as gels, hairsprays and mousses — can dry out your scalp and hair. So can shampooing too often or using hot water. Turn down the heat. If you use blow dryers or other heat appliances, take a break to see if that helps your scalp recover. Deep condition. If your scalp isn’t producing enough natural oils, a deep conditioning or hot oil treatment may help reduce itchiness and flaking. Try using this once a week to soothe and moisturize your scalp. Dry, brittle hair may also benefit from these intensive treatments. If doing this at home, follow the directions on the package to avoid leaving oily residue on your hair. Scalp massage. A gentle scalp massage will not only stimulate your scalp, but feels great. Ask for this relaxing bonus at your salon, either during your regular hair washing or hot oil treatment. Another option is to brush your scalp before washing your hair. This will loosen dead skin cells on your scalp. Use a brush with bristles that aren’t too stiff. Eat well. How well you eat can affect your scalp and hair. Make sure you are getting enough vitamin B6 and B12 by eating a wide variety of fruits, vegetables and whole-grain breads and cereals. Flaxseed oil, zinc and selenium supplements may also boost the health of your hair and scalp. Stay hydrated. Don’t forget to moisturize your scalp from the inside by drinking plenty of water throughout the day. Many fresh vegetables also contain lots of water, so loading up your diet with these can boost your hydration level. With dandruff, the skin flakes landing on your shoulder are usually larger and greasy or waxy. They may also be yellowish or grey. Dandruff is usually caused by a fungal or bacterial infection of the scalp. Dandruff can only be diagnosed by a medical professional. If you are concerned about your hair or scalp, or have bleeding, itching or oozing of the scalp, check with your doctor or dermatologist. Try Tea Tree oil. This natural essential oil has anti-bacterial and anti-fungal properties. This can be massaged directly into the scalp — you should dilute it first — or you can add a few drops to your shampoo. Avoid scratching. Scratching can damage your scalp. If the skin is broken, it will be more vulnerable to infection. Get medicated. An over-the-counter or prescription medicated dandruff shampoo that contains ketoconazole, selenium oxide or zinc pyrithione may help. These are antifungals, which kill yeast living on your scalp and can decrease the amount of flaking. Follow the instructions on the bottle. See your doctor. If these tips don’t help or you are still concerned about your dry scalp or dandruff, visit your doctor or dermatologist. Other health conditions, such as the inflammatory skin condition eczema, can cause a dry scalp or dandruff. These may need another kind of treatment. If you have flaking from your scalp, there is no need to be embarrassed. Many products and treatments are available to help relieve your symptoms. Ask one of our hair experts today for the best options for your hair and scalp type.